The Roxtec B frame is an openable metal frame that is bolted together from hot galvanised steel parts to form different sizes and combinations of openings. 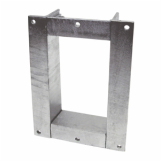 This frame is designed primarily for retrofits in buildings where it is important to be able to seal around existing cables and pipes. It has a 40 millimetre (1.575") flange and is intended to be cast into a wall or partition.